BREAK ARTS II on the Playism Store | Bringing a different breed of indie game to the world. Break Arts II is a fully customizable robot racing game with action features. Build your own robot and race it against other players online. Faster than anyone. Stronger than anyone. And more stunning.Customize your robot for “cyber battle racing” in a game that offers all the thrills of racing, battle, and customization.Online, Offline, Time-Attack... which mode will you dominate?! The biggest change from the previous game is the amazingly deep level of robot and weapon customization. Assemble your robot from a range of parts―each with their own abilities―allowing for virtually unlimited possibilities in customization! Some robot parts can fold and unfold, come apart, and rotate, so you can build your dream machine any way you like!Create the most awesome robot you can imagine and bask in the glory as you pilot it to victory. Horizontal boosting - a total game-changer! We wouldn't dream of leaving out the humor! 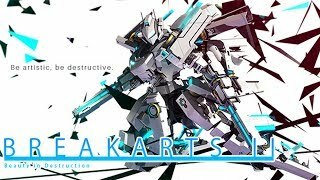 Listen... if you love robots, then this is absolutely your game! What do you think about BREAK ARTS II? A one-man studio based in Japan. A passionate 3D game designer, currently working on the racing game Break Arts II, the sequel to the smartphone game, Break Arts.